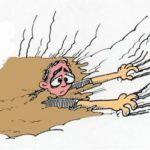 Do you sometimes feel spiritually weak? It can make us feel vulnerable, defenceless, weak and ashamed. But you don’t have to stay there! Click on the video and turn your weakness into strength. How has God turned your weaknesses into strengths? Just leave your comments in the box below. I have learned how powerful the Word of God is. I memorise scripture and speak it out loud in times of spiritual weakness or when I feel under attack. God’s word is like a nuclear missile aimed at my fears, weaknesses and insecurities. I have also found that when I praise God and acknowledge His power and sovereignty in every circumstance, I can feel strong again. I totally recommend the above things to help you in times of need. Thanks MaryAnn. This is very good advice for all of us. I’m going through a big time of spiritual weakness right now. I don’t know how anyone could cope for one hour without Christ to help and guide. Work hours have been cut to the point where it is difficult to make my payments for simple living. Feelings of abandonment from my family sometimes overwhelm. I desperately need a newer car but there is no money. I know this is only a period in my life. That God is growing me. It hurts but it helps.